Decades of groundwater pumping have left one of the San Luis Valley aquifers in a perilous state. To restore its health — and the foundation of the local economy — valley leaders are developing a plan to pay farmers to fallow up to 16,000 hectares. But with commodity prices soaring, will anyone go for it, or will the state have to step in? Colorado’s San Luis Valley is pinched by two mountain ranges, the San Juan peaks to the west and the Sangre de Cristo, seen here, to the east. The valley is the highest agricultural region in the United States. SAN LUIS VALLEY, Colorado — At an average altitude of 2,350 meters (7,700 feet), Colorado’s San Luis Valley is the nation’s highest agricultural region and one of its top potato producers. Almost by definition, water dictates the patterns of life and land. With it, valley farmers have turned this sunny, high-desert rift between the Sangre de Cristo and San Juan mountain ranges into one of the most densely irrigated expanses of farmland on the planet. Soon, though, a confrontation between rising global commodity prices, which are pushing production to meet demand, and shrinking water supplies, largely linked to climate change, could cause a number of growers here to do without. Like heavily irrigated areas in California’s Central Valley, in India’s northern regions, and in the North China Plain, the San Luis Valley has a groundwater supply problem. Since government-subsidized electricity arrived in the 1950s, farmers here have readily pumped from the two aquifer systems that soak up snowmelt like a sponge. Now, those decades of withdrawals have combined with recently lower-than-average river flows to affect water-rights holders along the Rio Grande River, which cuts through the valley before eventually becoming the Texas-Mexico border. Simply put, the San Luis Valley no longer has enough water to support the abundant farm production that is becoming increasingly supercharged by rising prices for the crops grown here. There may be a way out. Water officials in the region’s six counties are working with the federal government on a voluntary plan that would pay farmers to take land out of production. If things turn out as planned, up to 16,000 hectares (40,000 acres) of the valley’s roughly 240,000 irrigated hectares (600,000 acres) will not be farmed. Though it is still being negotiated, the plan has a significant obstacle: the explosive rise in food prices, which are making the sums offered by the water-conservation program less enticing. Prices for the valley’s mainstay — potatoes — have increased 25 percent in the last five years. Wheat, alfalfa, and barley prices have done even better, more or less doubling over the same period. “Industrialized agriculture is destroying this place,” says George Whitten, president of the Rio Grande Water Conservation District. 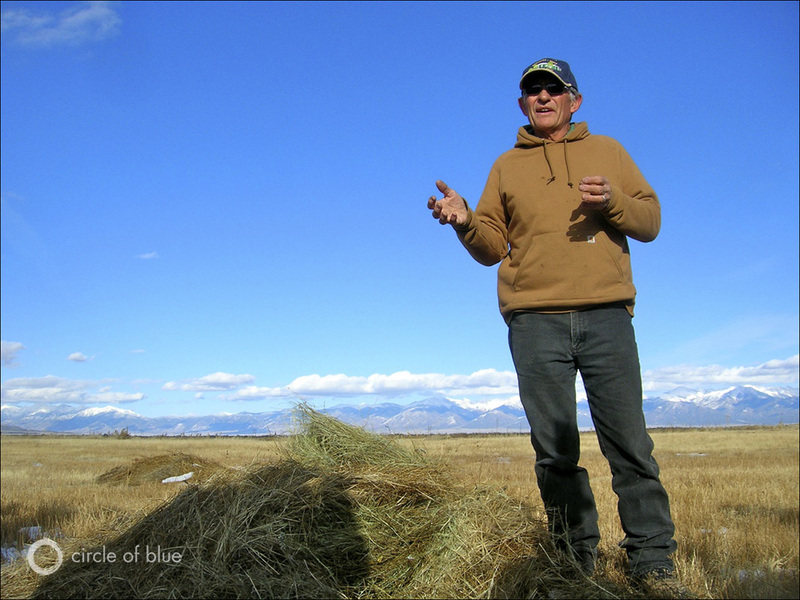 Standing in the pastures on his 1,600-hectare (4,000-acre) ranch in Saguache County, Whitten explains the district’s land-fallowing plan, in which up to 16,000 hectares (40,000 acres) will be taken out of production to protect one of the valley’s aquifers. If the voluntary program does not work, Vandiver went on to say, the result would be worst for farmers. The state, he said, would then step in — like it did in not long ago in the nearby South Platte Basin — and force well owners to shut down, without compensation. High commodity prices are affecting a U.S. Department of Agriculture land program. The Conservation Reserve Enhancement Program (CREP), which aims to prevent soil erosion, to conserve water, and to increase wildlife habitat by converting cropland to cover crops, is rolling from a double-punch from markets and from politicians. The Minneapolis Star-Tribune reported that soaring grain prices are forcing farmers to reconsider participation in the program. Congress, in a budget-cutting mood, is mulling a proposal for next year’s iteration of the Farm Bill, hoping to decrease the amount of acres that can enrol in CREP. 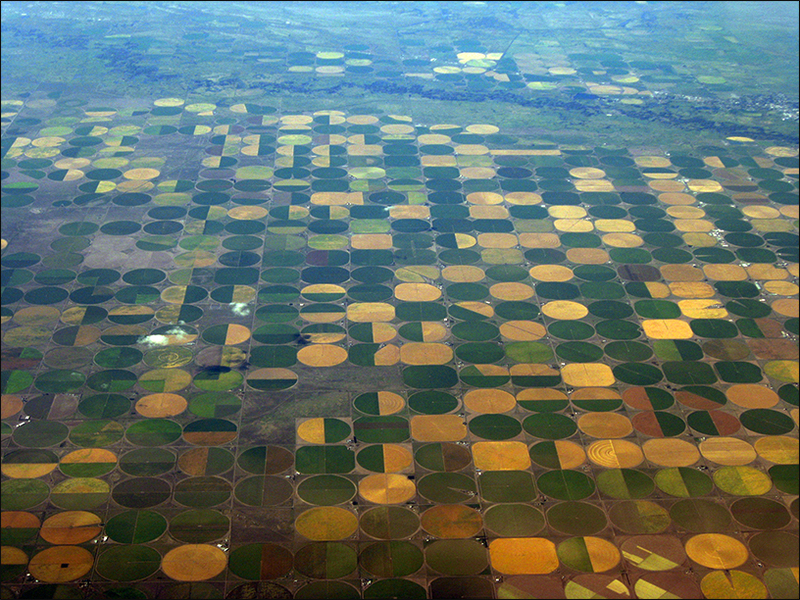 Viewed from above, the San Luis Valley is a punch card of tightly packed center-pivot sprinklers that can pump four cubic meters (1,000 gallons) of water per minute. Settlers started farming the valley in the 1850s, and, by 1903, all of the available surface water had been claimed. Because the valley receives so little rain — just 75 millimeters (three inches) more in a year than what Las Vegas receives — everything is irrigated. Years ago, farmers relied on groundwater only to finish off the last weeks of the irrigation season, when surface flows were dwindling. But for the last two decades, surface flows in the Rio Grande have declined in comparison with the historical average, said Mike Gibson, the manager of the San Luis Valley Water Conservancy District. To make up for the shortage, farmers have pumped groundwater to take up the slack. Climate change plays a role in the new river patterns, Gibson told Circle of Blue. Wind storms from the deserts in Arizona and New Mexico are more frequent, and they drop dust on the mountain snowpack, which is the primary water source for the valley’s rivers. The warming effect of the dust, combined with higher temperatures, means that the spring melt has moved several weeks earlier in the year. With a longer dry period in the summer, more groundwater is required to balance the changes in the river. New reservoirs to store the altered flows are prohibited under a compact between Colorado, New Mexico, and Texas, Gibson told Circle of Blue, but existing reservoirs are being renovated to maximize their storage capacity. Vandiver told Circle of Blue that the valley is millions of cubic meters shy of sustainable water levels in the aquifer systems. Each year roughly 615 million cubic meters (500,000 acre-feet) are pumped to produce the bounty of alfalfa, barley, potatoes, and leafy greens that contributes nearly 40 percent of the valley’s economy. The water district banned new wells in the deep aquifer in 1972 and in the shallow aquifer in 1981 — but the over-pumping persists. The district is still developing groundwater models to determine how much of the annual deficit needs to be paid back. “We have a huge economy here, based on a resource that doesn’t exist,” says George Whitten, president of the Rio Grande Water Conservation District. 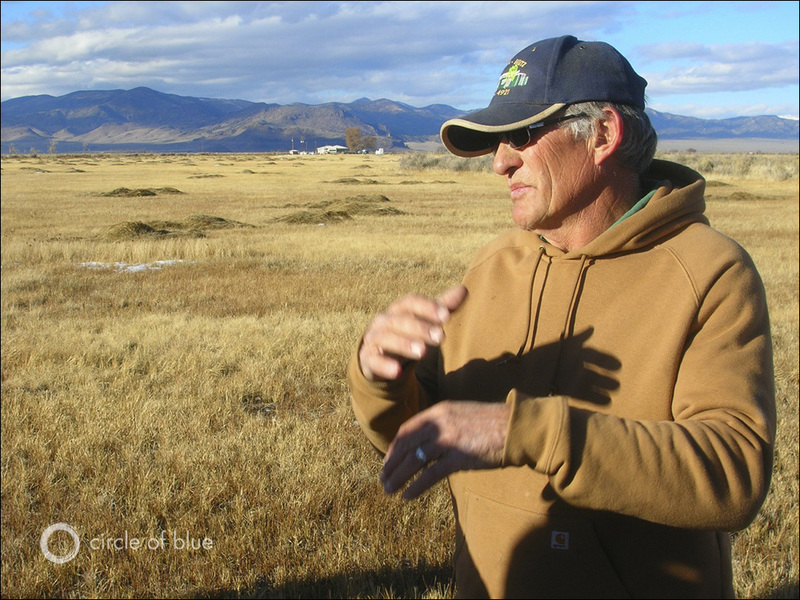 Whitten’s family has owned Blue Range Ranch since 1897, and he believes that, at the current rate, the agriculture-based economy and the water won’t last for much longer. The valley’s water agencies are working with the U.S. Department of Agriculture’s Farm Services Agency to approve an incentive program that would pay farmers to leave their land fallow. The incentive is authorized by the Conservation Reserve Enhancement Program (CREP), which was enacted by Congress in 1997 to improve water conservation, wildlife habitat, and soils. The southwest windows in the Whitten kitchen face the San Juan Mountains. 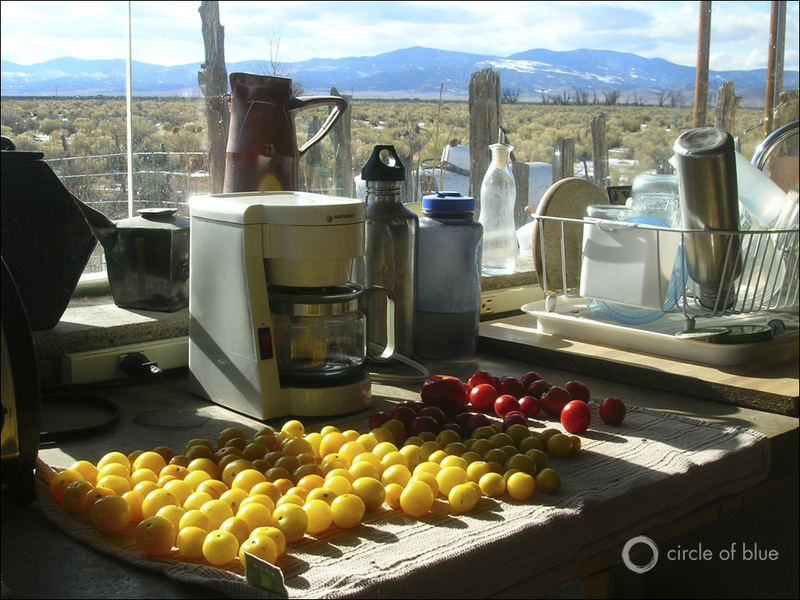 On the counter are Siberian tomatoes, a variety well adapted to the valley’s short growing season. The Farm Services Agency runs water conservation CREPs in Colorado, Idaho, Kansas, Nebraska, and Oregon. The agency spent $US 164 million on CREP payments nationwide during the 2010 fiscal year. The Republican River Basin is the only CREP program currently in Colorado, and it began in 2006 with a goal of fallowing 14,000 hectares (35,000 acres). But high crop prices have proven to be an impediment in Colorado and in other states — as of October, the program had enrolled less than 60 percent of that target acreage. Under the San Luis Valley plan, farmers would sign a 15-year contract to take land out of production. They would receive an annual payment per acre, based on local land rates. Valley water officials are asking the federal government for an annual average of $US 370 per hectare ($US 150 per acre). In addition, the local government must provide at least 20 percent of the program cost. The Rio Grande Water Conservation District is meeting this requirement by levying a “pumping fee” between $US 35 and $US 60 per 1,000 cubic meters ($US 45 and $US 75 per acre-foot) on farmers who pump groundwater in excess of their surface water right. The fees are charged to irrigators in Subdistrict No. 1, a patch of land north of the Rio Grande, where the aquifer is most depleted and where the fallowing would occur. A smaller administrative fee is also charged to all irrigated land. Officials in the San Luis Valley’s six counties are working with energy companies to develop solar power on exhausted farmland. 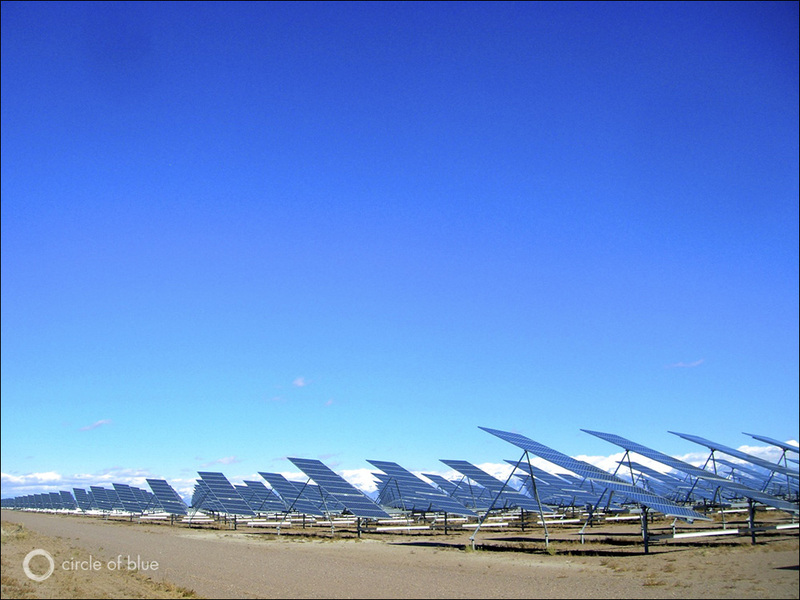 SunPower’s 17-megawatt photovoltaic array in Alamosa County, shown here, was the largest in Colorado when it began generating power in December 2010. Valley officials hope the plan will be approved in time for this year’s irrigation season, but they cannot foresee how its effects will ripple through the community. “We don’t know what the economic and social impacts will be from taking tens of thousands of acres out of agricultural production,” Gibson said. And if the goals of the management plan are not met, the state is waiting in the wings to enforce the limits with mandatory restrictions. The state engineer, who oversees water rights, will present draft rules to the state supreme court this year. George Whitten’s family has owned Blue Range Ranch since 1897. If we’re going to continue agriculture in the Mountain West, he says, ranchers and farmers will have to consider the proper animals and plants for a drier future. So, in essence, those farming in the depleted section of the aquifer have to ask themselves this question: If we pass up the land-fallowing deal and continue reaping jackpot harvests, can we find the surface water offsets that the state could require? Karla Shriver, who for 26 years has grown potatoes on 400 hectares (1,000 acres) south of the Rio Grande, is someone who believes more people will take the payments rather than leave it to chance. She told Circle of Blue that, looking long term, the CREP money may be the best offer that farmers could get. Because the area gets an average 340 days of sunshine per year, the San Luis Valley is at the center of solar power development in the Western U.S. The Bureau of Land Management has put four parcels of land it manages on the “fast-track” for regulatory approval, and several investor-owned companies are already operating in the valley. If hectares of silicon panels were to replace irrigated crops on worn-out land, this solar industrialization could also help the water problem. But solar jobs are not farm jobs, and valley residents have pushed back against large solar projects. Besides, farming has been not just a way of life, but life itself here for the last 150 years. Part of the reporting for this story was done while the author, Brett Walton, participated in a fellowship that was paid for by the Institutes for Journalism and Natural Resources. San Luis Valley from the air. It would seem that the best solution is permaculture. Assuming the only problem is a weakening aquifer. P.S. I sense that there are political challenges imbedded in this problem. RE: But solar jobs are not farm jobs, and valley residents have pushed back against large solar projects. The problem was caused by the government and now we believe they can fix it???? Its time for the government to quit stepping in and subsidizing everything. get out of the way, let capitalism take over and it will work its self out. Yes some people may have to move or change their practices but that is life. The most efficient and economical practices will survive, just like in any normal business. This problem comes more out of greed and envy than anything. Its hard for a man who has done nothing different in 50 years and is no longer competitive in the market to look across the road and see his neighbor having some success. In most areas of the SLV there isn’t even proof that well owners are damaging their neighbors surface water. The only cases to even consider are the shallow surface wells. The deep wells are in a complete different aquifer separated by barriers of blue clay and other formations. It may have more to do with the 10+ year drought we are in. If there is a lack of snow in the mountains that may have more to do with your ditch being dry than your neighbors well. Besides the reason he was proactive and had a well drilled was for dry years! There are some that only rely on wells, and the government should have to answer for that, they are the ones that gave out those permits. Punishing your neighbor is not the answer.Its not his fault, he paid for a well or paid a property value according to the water resources and had a valid water right with it. If the government wants to fix this they should take the blame and except responsibility for the shallow surface wells that could effect ground water. They issued the permits! There is nothing ethical about fees and fines or some big government nonfunctional program. We don’t need a program to take from one to pay another, that’s just another welfare program. Farmers complain about people on welfare, yet they are the biggest welfare recipients there are. They get nrcs grants, subsidized insurance, drought relief, disaster relief and many others. This is a disease in the SLV and America we need to fight before we end up with some freedom denying, corrupt, social monster that has reduced us from the greatest country on earth ( due to freedom and capitalism) to a country of dependent’s in a soup line. The saddest part of it all is that we are the ones spurring it along with mentalities and policies that we have developed like the ones we are creating in the SLV.